Obituary – Harbaugh, Alta « Perry High School Alumni Association, Inc.
Red Hots, Basketball ’24, Philomatheans. Alta Harbaugh, eighteen year old daughter of Mr. and Mrs. Charles Harbaugh, died of Typhoid fever at 5:05 o’clock Tuesday evening at the University of Oklahoma infirmary at Norman after short illness. She was enrolled as a freshman in the college of arts and science in the University. She became ill with typhoid after returning to University after the Thanksgiving holidays. Her family was called to Norman Sunday all were with her until she died. 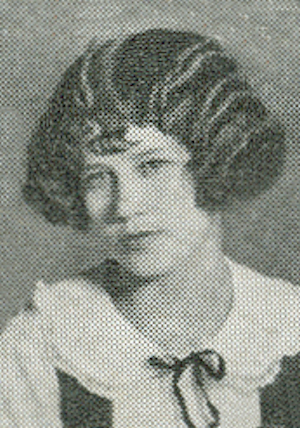 Alta was a graduate of Perry High School and graduate of the 1925 class. She was a popular girl in school, belonging to the red hots a high school girls pep organization, was assistant editor of the Spirit, high school student publication, and was past Worthy Advisor of the Rainbow Order of Girls. She is survived by her mother and father, twin sister, Alpha, and two other sisters, Beryle and Margaret and a brother Russell. Service were held at the Baptist Church and burial was made in Grace Hill Cemetery.